Iran's supreme leader has described Donald Trump as "mentally retarded" as he urged Europe to do more to back the 2015 nuclear deal after the US president refused to re-certify the pact. European companies have rushed into the Iranian markets since the landmark accord, and Ayatollah Ali Khamenei's comments show he hopes to leverage them into protecting the nuclear deal. 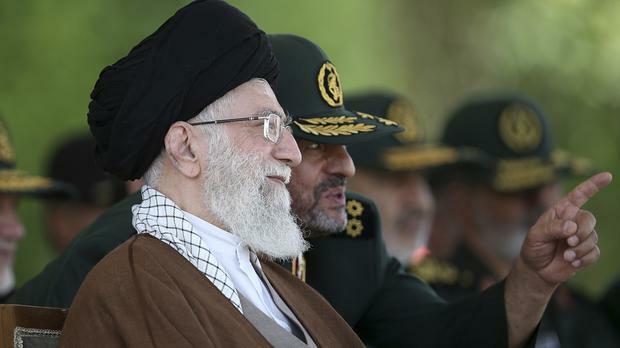 While offering harsh criticism of Mr Trump, Ayatollah Khamenei wants to ensure that Tehran continues to have access to the international market for its crude oil as part of efforts to revive a stagnant economy. "The European governments have underlined the nuclear deal's issue and condemned the US president's remarks," Ayatollah Khamenei said, according to comments posted on his official website. "We welcome this approach but it is not enough that they only tell him not to tear up the deal. The nuclear deal is to their benefit." He said: "I will not spend time to respond to the nonsensical comments by the foul-mouthed president," and referred to Mr Trump and his administration as "mentally retarded". He also warned that if the US tears up the deal, "we will shred it into pieces". The 2015 deal curbed Tehran's nuclear programme in exchange for lifting international sanctions on Iran. European aviation consortium Airbus signed billions of dollars in sales agreements with the Islamic Republic, France's Total SA and state-run China National Petroleum Corporation signed a 5 billion dollar agreement with Iran to develop the country's massive offshore natural gas field, and French motor manufacturer Groupe Renault signed a 778 million dollar deal. Britain, China, France, Germany, Russia and the European Union - the other parties to the nuclear accord - have been telling Mr Trump's administration to stay in the deal. His refusal last week to re-certify has sparked a new war of words between the Islamic Republic and America, fuelling growing mistrust and a sense of nationalism among Iranians. Mr Trump also criticised Europeans for their participation in Iran's energy projects. He said he de-certified the accord on the grounds that Iran had committed several violations of the deal but he did not announce a withdrawal from the pact, instead shifting it to Congress for a decision.